From her first Souper Diet in 2014, SouperChef Anna has lost 4kg after 28 days and kept the kilos off successfully with clean eating habits. On her second go at the Souper Diet in January 2015, she lost 1.6% in body fat, gained 1% muscle mass and 1.2% total body water! This time round in January 2016, she has lost a whopping 6.5kg and 3.2 inches off her waist! Click here to see her weight loss stats and why our soup diet or cleanse really really works! This soup diet goes beyond the mere motivating numbers. It’s also about how it makes you feel and how you can sustain the weight loss results that makes us so souper stoked to share this with you! We know there will be challenges, so SouperChef Anna has shared her soup diet weight loss experiences, tips and some before-after pictures on her blog to support your weight loss journey! 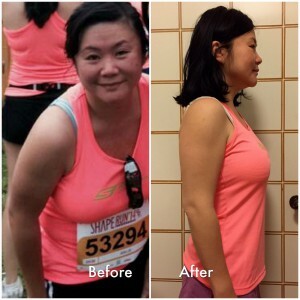 Check out her Souper Diet journey from the blog!